There was a lot to get excited about at the University of Toronto’s Scarborough Campus in the summer of 2015, with the opening of the CIBC Pan Am / Parapan Am Aquatics Centre and Field House in March 2015, prior to the start of the games. The Aquatics events only upped the ante, as Canadian swimmers hauled in an unprecedented number of medals at the games, many of them Gold. 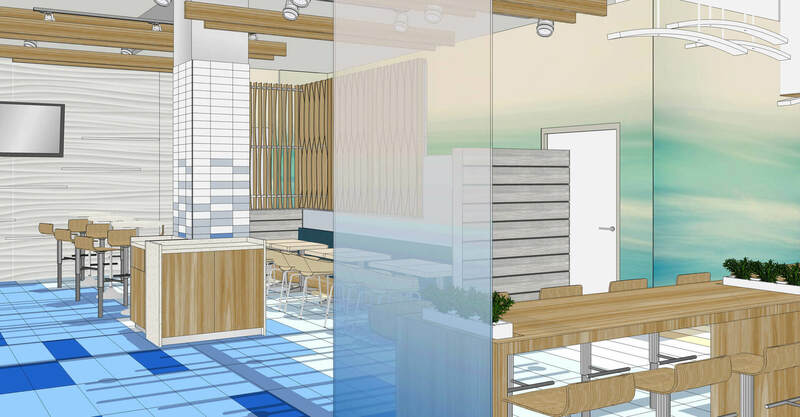 But there’s more to get excited about at the pool than just the swimming, if you’re into retail design. 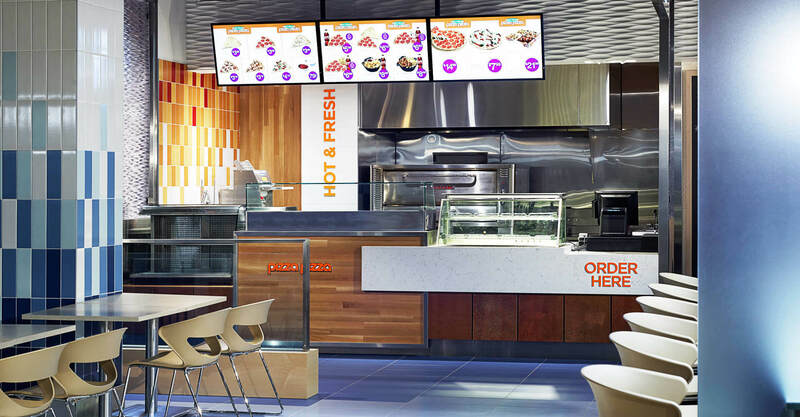 We developed the design for the Aquatics Centre food court, creating a contemporary space that housed multiple retailers in an area designed to showcase each brand in a consistent setting. We were very thoughtful of the guest interaction with the space, and the pathways they would take to get to and from the retailers, seating area, and the rest of the facility. It was critical that we create a homogeneous space that spoke to the attributes of the facility, but also gave retailers an opportunity to distinguish their brands and showcase their products. It was also essential that we adhere to the new guidelines put forth in the Accessibility for Ontarians with Disabilities Act (AODA), which impacted different aspects of construction, including lower counter heights and wider pathways for increased accessibility. 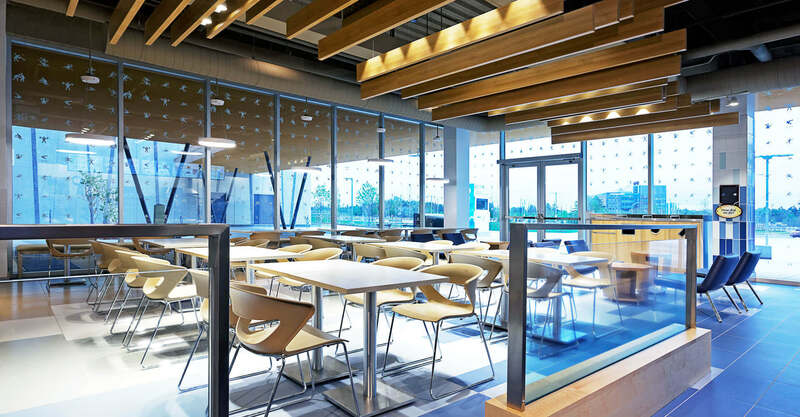 The Centre is located at the University of Toronto Scarborough Campus, and the outdoors is brought into the space through the use of natural wood throughout. It was important to remember throughout the design process that while we were designing a space to be used during the Pan Am and Parapan Am Games, the facility is part of a University campus and will be used by both the University and the greater community beyond the Games. As an Aquatic Centre it was important to communicate the nature of the Centre throughout the space. 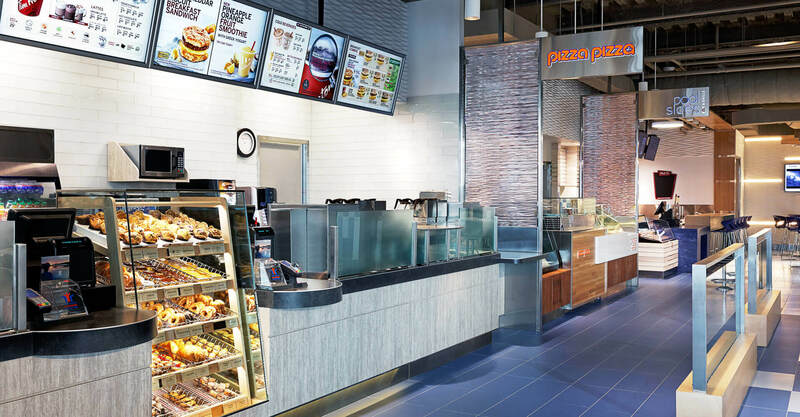 To achieve that we used blue tiles of varying hues on the floor and up the pillars, employed blue wave graphics on walls, and divided the food vendor counters with rippled stainless steel panels reflecting the shimmer of water. In the ceiling, the faux beams were suspended at varying heights to resemble waves and also hides the downlighting on the dining tables. Tempered glass railings section counters from seating but provide transparency throughout space, allowing light to flow between areas. Flexibility in the space was critical, and we accomplished that by introducing no less than 6 different seating types into the space, with all but two of them movable. 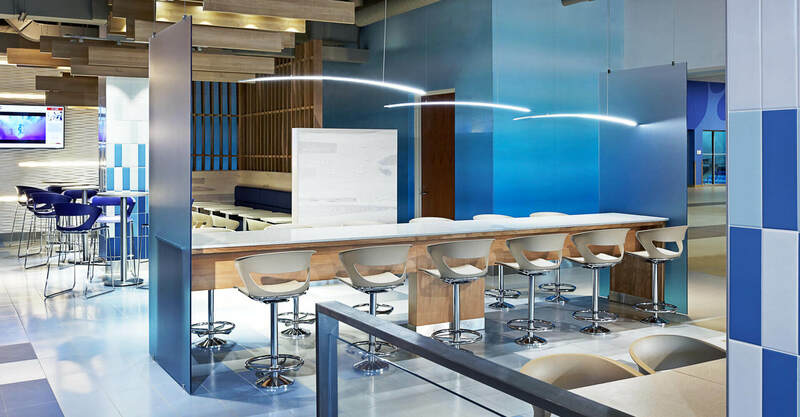 The lighting over the two-sided dining counter is set at varying heights and mimics waves while also creating a visual divide. Fixed seating included two different styles of banquette. 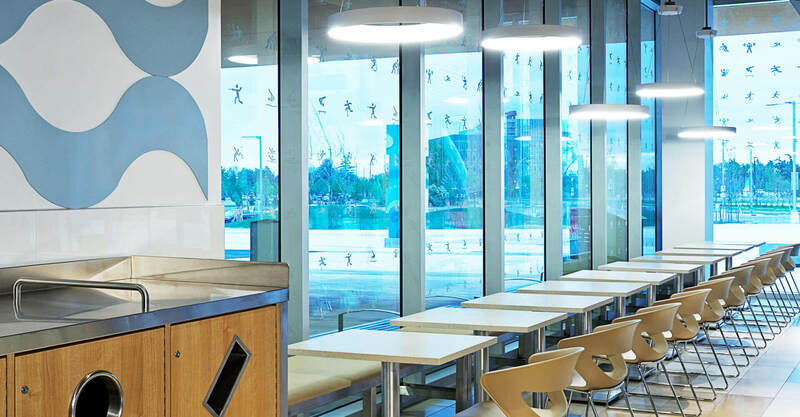 The first was situated along the full height glass separating the food court from the pool itself, and it was important that this seating be minimal to increase the transparency between the two spaces, giving people as good a view of the pool as possible while dining. The second banquette is more private, and features a high-back bench for increased comfort. It is also separated from the walkway behind by a full-height wood slat wall with curved boards creating an art piece reflecting the waveforms of the water. 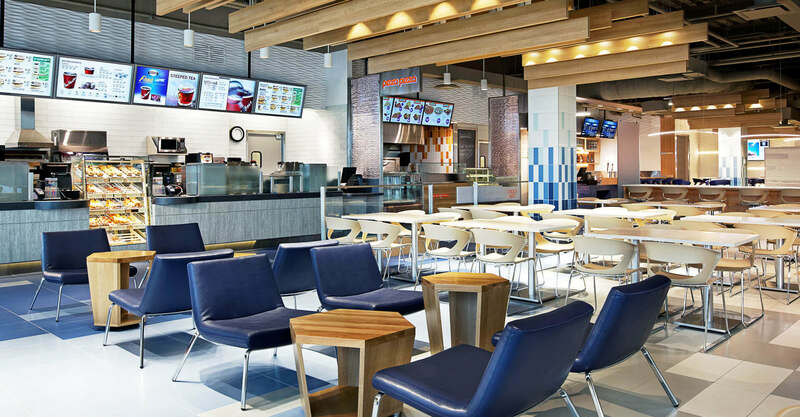 Flexible seating includes comfortable chairs with low tables for small group social snacking or having a coffee; movable tables and stylish chairs in the middle of the space for larger group dining; counter seating for individuals grabbing a quick bite, and high tables for small groups. 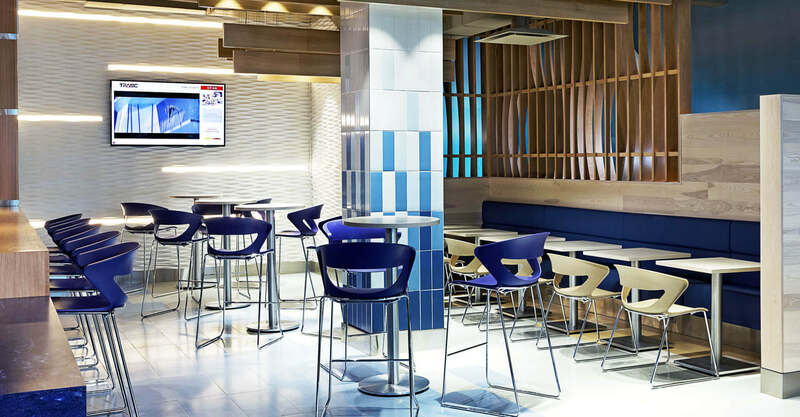 In addition to designing the space at large, we worked with both Pizza Pizza and the Pool Sides Bar & Grill (Aramark) to develop their individual spaces and in the case of Pizza Pizza, to modernize their architectural décor package. This was an inspiring project that will serve the Games well this July/August, and the University well into the future. 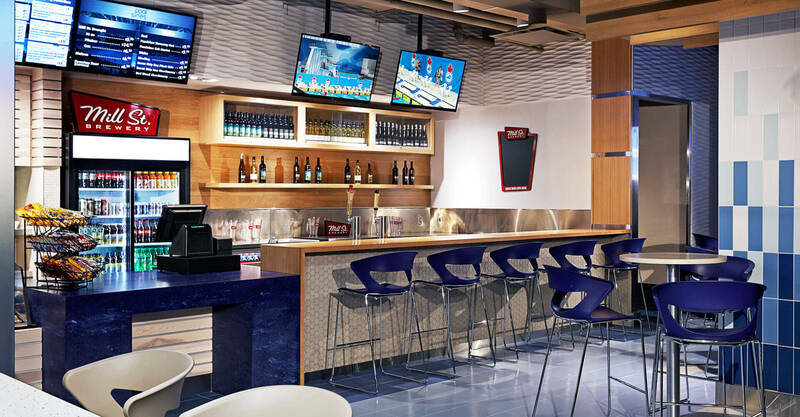 We are proud to have had a hand on the success of the Pan Am and Parapan Am Games, and hope the competitors and spectators enjoy the space we’ve worked hard to create. Go Canada!